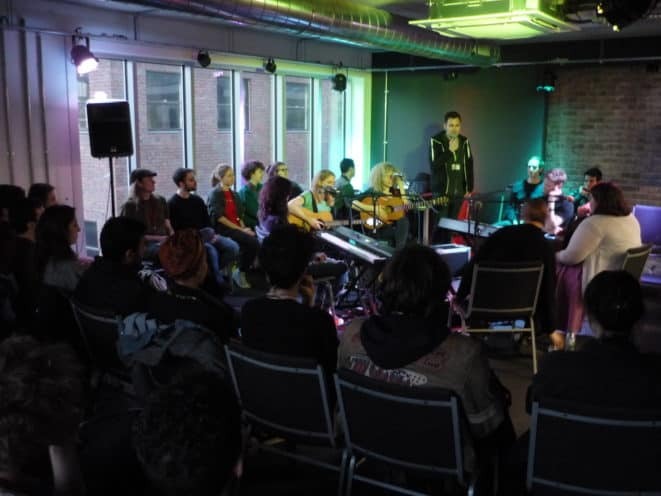 The beginning of the week saw the start of a new month, but sadly the last of the Songwriter’s Circle event at ICMP for this term. This latest session introduced four ICMP students – Ronni Mardor, Irene Skylakai, Stina Mai, Sophie Holden, and was hosted by ICMP Songwriting tutor Shane Beales. Each songwriter showed natural and genuine songwriting talent, with a flair for performance that engaged and inspired a room packed with fellow students and guests. Ivors Academy member Fiona Bevan was the featured guest artist who also performed tracks from her previous albums and a new song from her next release which had a lovely ‘old skool’ Nashville vibe. Fiona also delighted the audience through sharing her career story with anecdotes from past co-writing projects, travelling and studio sessions. The evening was a relaxed, intimate and inspirational occasion where ICMP students shared their own unique song craft – what a wonderful start to my week! I look forward to being invited to the new season of Songwriter’s Circle events in the new Summer Term. The Ivors Academy thanks Sophie Daniels (Head of Songwriting), Jonathan Whiskerd (Programme Leader – BA Songwriting) and Shane Beales (Songwriting tutor) at ICMP for providing the Ivors Academy with an invitation to this event.